Are you a new or old mum? Do you feel your pelvic floor isn’t what it used to be? Do you worry about accidents in the gym? Are you looking to improve your tummy muscles again? If you answered “yes” to any of these then the Holistic Core Restore (®) Pelvic Floor and Core Fitness Programme is for you! This course is a comprehensive 12-week programme designed for women at all stages (from pregnancy through to postnatal and way beyond) who want to work on pelvic floor, core and overall health with a functional exercise programme. We also talk about nutrition to aid recovery and there are homework videos to enhance your progress. You get your own exercise booklet and kit included. The NEW programme is split into two phases – the first 6 weeks will be weekly classes with me, then the second 6 weeks will be an online programme, with ongoing support from me. Phase 1 we will start to strengthen your abdominals, core and pelvic floor. It also allows time to master the exercises. Phase 2 will ensure you capitalise on what you have achieved already and help you integrate core and pelvic floor exercise into your life on an ongoing basis as well as really starting to achieve results. Included in the price is all the kit you will need (worth £20), an information booklet, a homework portal that you will have access to for life. Numbers will be capped at 8 people to ensure I can give you maximum attention throughout the sessions. If you are new to the course please email to receive a copy of the pelvic health and core pre-screening questionnaire before booking. This will help ensure the course is right for you. 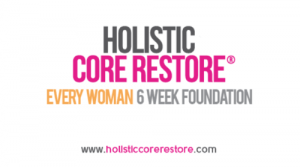 A BESPOKE programme grounded by a hands-on assessment, and clear direction on healing nutrition, clear instructions on helpful and non-helpful lifestyle choices and most importantly a safe, ’functional’ and modern movement and exercise programme that will help you heal your Diastasis, improve your Core function and guarantee you a better looking belly and a Pelvic Floor that does its job. The programme last for an initial 6 weeks but can be lengthened to allow more progression and better results. The programme has a focus on nutrition. We heal from the INSIDE OUT! And I have simple but highly effective strategies for helping you get the specific vitamins and minerals required to heal your Diastasis into your diet easily. The high cortisol levels associated with the Post Natal period also retard healing and cause you to hold fat around your middle. This programme helps you to help yourself to not only a better looking belly but one that FUNCTIONS and supports your Pelvic, Core and overall health. Linking with specially trained Post Natal Women’s Health specialists in this area and mean you will be referred to a clinical specialist when this programme isn’t the answer for you. Healing a Diastasis Recti is a WHOLE BODY ISSUE, it’s not just about exercise, it’s not just about the woman’s belly and it’s not just about the gap! A deep assessment is required to start with then a programme that focusses on nutrition for healing, the woman’s breathing strategy and postural alignment, all need to be considered BEFORE we apply exercise and load. Improve your belly, rid yourself of backpain, reconnect to your Pelvic Floor so that you both FEEL and FUNCTION better.